Now a major motion picture The tale of a passionate, independent woman and her three suitors, Far from the Madding Crowd tells the story of Bathsheba Everdene and her relationships with the devoted Gabriel Oak, the dashing Sergeant Troy, and the reclusive gentleman farmer, Mr. Boldwood. Through her wayward nature and a winding path of events propelled by Thomas Hardy's recurring feminist themes, Bathsheba is led to tragedy and, finally, true love. 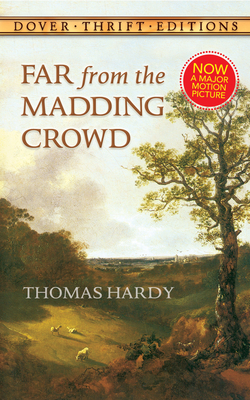 Written in 1874, Far from the Madding Crowd was Hardy's first masterpiece. Alive with lush, idyllic settings that exert profound influences on the novel's characters, it is an unforgettable narrative of both beauty and devastation. Its portrait of rural life, and compelling examination of social conventions, has made it one of English literature's greatest works. Tragedy haunts the works of Thomas Hardy (1840-1928), whose fiction abounds in star-crossed lovers and other characters thwarted by fate or their own shortcomings. Hardy's outspoken criticism of Victorian society excited such profound controversy that the author abandoned fiction and in the 20th century published only poetry.